Nichole is a recent graduate from the University of Alberta, receiving a B.Sc. in Environmental & Conservation Sciences. Growing up in Southern Alberta, Nichole’s love for wilderness began by camping and hiking in the Rockies. These days, you can find her canoeing and exploring in Northern Saskatchewan. Nichole loves connecting people with nature through environmental education and has worked with youth for several years. 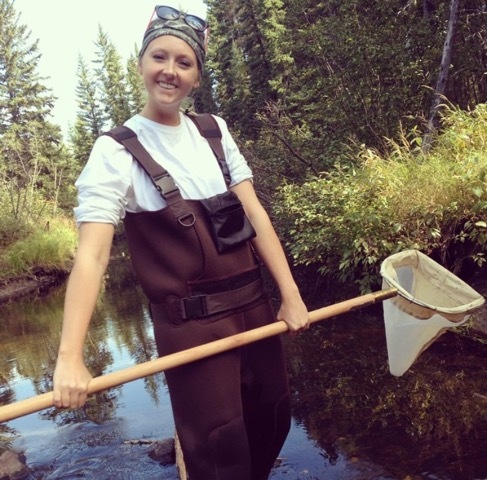 With past summer jobs ranging from municipal waste reduction to oil sands reclamation research, Nichole finds all aspects of environmental sciences fascinating and is keen to keep learning. Maria grew up on a farm near Prud’homme Saskatchewan where she developed a love for agriculture and the environment. She enjoys fishing, canoeing, playing sports and travelling. Graduating from a francophone school gave her a passion for culture and education. Maria is now a student in the College of Education at the University of Saskatchewan. She is studying to be a high school teacher with a focus in Physics and French, however, she is looking forward to teaching a wide variety of subjects throughout her career. She is always eager to learn new things and she has recently developed a growing interest in ecology and environmental sciences. Jady was born and raised in Regina, Saskatchewan. Her passion and love for nature developed when she was very young. Her family did a lot of exploring, camping, hiking and travelling which lead to her perusing a path in which she could develop a career that incorporates what she loves. Straight out of high school she attended the University of Regina in the combined Environmental Biology program offered through the University of Regina and Saskatchewan Polytechnic, Prince Albert. After two years at the U of R, she then completed her Integrated Resource Management diploma through Saskatchewan Polytechnic, Prince Albert. In 2016 she graduated from the University of Regina with a bachelor of science in Environmental Biology.